Too Noisy! by Malachy Doyle and Ed Vere. I flat out love this book and the Bungle family. The truly musical, full of sounds, fun to read aloud text. The way sound is illustrated by flatly colored speech bubbles throughout. “And so he upped and so he offed and so he wandered to the woods.” The whole book is full of rhythmic writing like that. The sounds in the woods are little sounds. The tiny pastel speech bubbles of birds and rabbits and mice. But further in the woods, it gets dark. And it’s not the sounds that bother him so much as the feelings. The scary feelings of what he can’t see or hear. 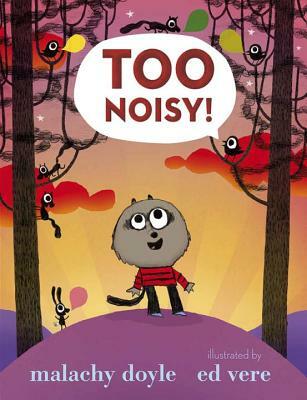 Sam could really use a noisy Bungle then! Thanks to Candlewick for the image! TOO NOISY. Text copyright © 2012 by Malachy Doyle. 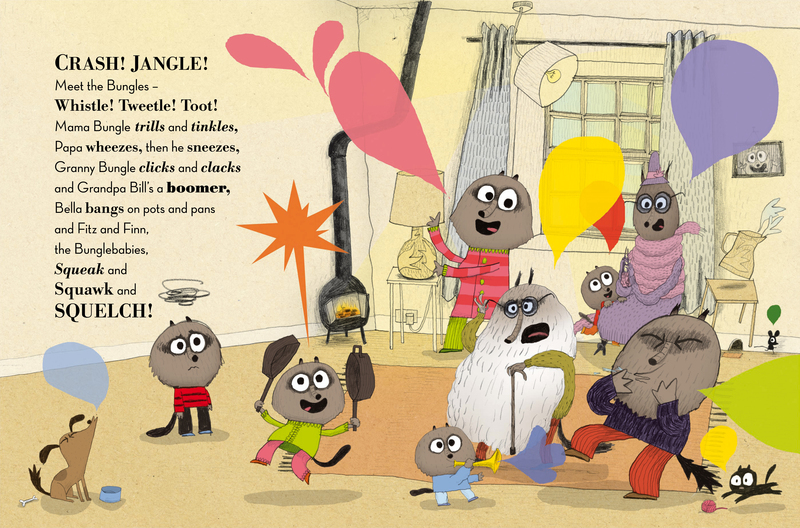 Illustrations copyright © 2012 by Ed Vere.Reproduced by permission of the publisher, Candlewick Press, Somerville, MA on behalf of Walker Books, London. Wanna make some noise now? Collection of vintage noisemakers from RD1 Vintage on etsy. Fringe party horns from Hello Happy Day Prints. DIY party blowers from Julep. Bird warbler water whistles from Shop Sweet Lulu and Little Citizens Boutique. And Tin can drums from Cool Progeny too. Or you can always just hum like Sam the quiet, middle Bungle. Just reviewed this one on Friday myself! Too funny! But you have great noise making suggestions, so if you don’t mind I’m going to link your post! Great books float to the top – no cats involved!